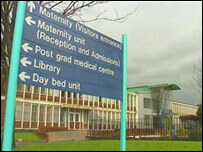 Campaigners and politicians have welcomed the surprise decision to reprieve a closure-threatened hospital. The Queen Mother's is to remain open and a new hospital combining maternity, paediatrics and acute adult services is to be developed in Glasgow. Local MSP Pauline McNeil said the news marked a "good day for democracy". 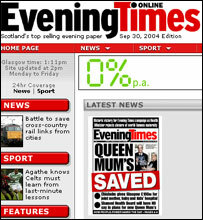 The Glasgow Evening Times, which lobbied to save the hospital, said the decision was a "tremendous victory for people power". Earlier this year the Greater Glasgow Health Board decided to close the Queen Mother's, which is on the same site as the Yorkhill Hospital for Sick Children. The Queen Mother's Maternity Hospital which delivers about 3,500 babies each year, has 70 maternity beds, an intensive care and a special baby unit. Campaigners mounted a high-profile protest against the board's decision to close the Queen Mother's. The Evening Times gathered 156,000 signatures on a petition which was handed in to Mr Chisholm. Its editor, Charles McGhee, said of the minister's decision on Thursday: "It's proof that newspapers, working closely with the community, can take on powerful and unaccountable bodies such as health boards and win. "The health minister promised us at the beginning of this campaign that he would not necessarily rubber-stamp the board's proposals and he has remained true to his word. "Mr Chisholm's decision is also a victory for Scottish democracy and the new Scottish Parliament as it is unlikely that remote politicians in Westminster would have delivered this result for Scotland." Campaigner Shona McMahon said she was "absolutely delighted" at the announcement. "It is amazing news. We campaigned very hard and the overall feeling is that Malcolm Chisholm has made the right decision." The minister's plans will see services maintained at the Queen Mother's until 2010 after which a new super-unit will open which will provide paediatric, maternity and adult clinical services. The site of the new hospital, and clinical matters, will be decided with by a special advisory group chaired by Professor Andrew Calder, head of obstetrics and gynaecology at the University of Edinburgh. Ms McNeill, whose constituency includes the Queen Mother's Hospital, said during the Scottish Parliament's health debate on Thursday, that Mr Chisholm had proved that "ministers could say no as well as yes". "This is a good day for the babies and children of Scotland," she added. Ms McNeill went on to say that lessons must be learned by the Greater Glasgow Health Board. Reacting to the minister's decision, the board said it would have to consider carefully its response and it reiterated members' original concerns. "The core of our submission to the health minister was very detailed concerns about our ability - even in the short term - to maintain maternity services on three sites," it said in a statement. "These concerns are shared by clinical staff right across Glasgow and we will work with the advisory group on those immediate and pressing issues, in particular with regard to medical staffing and taking forward the option appraisal as quickly as is practicable," the statement said. Liberal Democrat MSP Robert Brown said Mr Chisholm had undoubtedly "pulled a rabbit out of hat". He added: "This is exactly what many of us have been calling for. 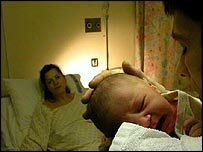 The central point was to keep the unique link between paediatric and maternity services." Tory MSP Mary Scanlon congratulated campaigners for their "great victory". She said: "I have absolutely no doubt that if it wasn't for this motion coming along today they may well still be faced with that uncertainty." On concerns about transporting pregnant women in the Highlands and Islands, the MSP said: "There's no point in having gold-plated standards in Inverness when women are giving birth in lay-bys down the A9 between Wick and Inverness."